Carnitor (Levocarnitine) is used to increase the efficiency and endurance when performing physical exercise and to make muscle mass growth more active, often used by those people who practice sport nutrition. Manufacturer : Modi-Mundipharma Pvt. 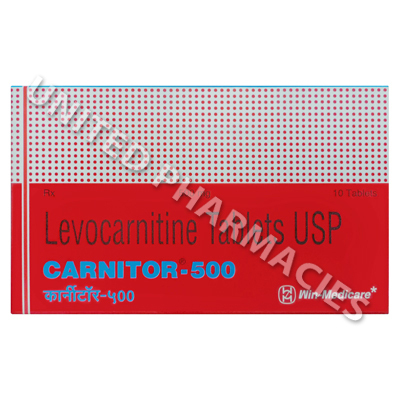 Ltd.
Carnitor (Levocarnitine) is indicated to patients, who were diagnosed with cardiovascular diseases to increase their tolerance to physical exercise; to elderly patients to slow down brain aging process, activate memory, and increase concentration; to premature babies and babies during their intensive growth to regulate the weight and to facilitate proper development of the skeletal muscles. Carnitor (Levocarnitine) can be recommended to people, practicing vegetarianism to make up for the deficiency of Levocarnitine, patients with physical exhaustion and low appetite. The dose in these cases has to be prescribed by a medical specialist. Medications containing Levocarnitin are also prescribed as part of the comprehensive therapy as an auxiliary medication. This use is reasonable for patients with liver, endocrine, and cardiovascular disorders. Carnitor (Levocarnitine) is taken by mouth, with or without food. Patients should strictly follow the instructions of the physician. The tablets are swollen whole with a full glass of water. The dose should be defined by a medical specialist, depending on the patient's health condition and indications. In most cases, adults are recommended to take 250-500mg 2-3 times per day. For sports purposes, it is recommended to take 500-1,500mg once before the training session. The duration of treatment should not exceed six months. Normally, Carnitor (Levocarnitine) is well tolerated. However, occasionally it may cause side effects: in particular, dyspeptic disorders, allergy symptoms, and pain in the upper abdomen. Patients who suffer from uremia may develop muscle weakness. Therefore, patients are advised to contact their physician in case they notice any of the above side effects. It has to be taken into account that the potential benefit or damage that may be caused by Carnitor (Levocarnitine) depend on whether the patient is using it in accordance with the instructions. Carnitor (Levocarnitine) can be harmful only in case of self-medication without supervision. Please consult your physician regarding the best administration regimen. Patients practicing vegetarianism should also consider which products contain natural Levocarnitine: fish, milk, and meat; that is why those patients may need to take Levocarnitine. Carnitor (Levocarnitine) is officially allowed as a sports supplement. It boosts endurance, however to achieve the best results it is essential to follow healthy balanced diet. Sometimes, to achieve better results it is combined with other fat burners, such as gainers (carbohydrate-protein supplements), proteins, coenzyme Q10, and other complexes. Pregnancy, breast feeding (it is not recommended to take Levocarnitine).